Delbert "Gene" Britton, 73, of Jerusalem died Wednesday, March 27, 2019 near Lewisville. He was born June 22, 1945 in Bellaire, a son of the late William Britton, Sr. and Lula Gallagher Britton. Gene was a retired employee of the former North American #3 Mine near Jacobsburg; he also worked for many years as a tugboat deck-hand following his retirement from the coal mine. 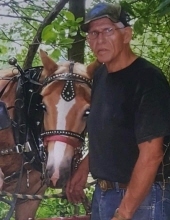 An avid horseman, Gene loved trail riding with various saddle clubs in which he belonged and also traveling with friends on wagon train rides. Many may remember him best as one of the first CB radio operators in the area, known to many simply by his CB handle, "Carpetbagger," or "Muleskinner." In addition to his parents, Gene was preceded in death by a son, Thomas Lee Britton; also by a brother, Bill Britton. Surviving are his children, Kimberly (James) Kernen of Beallsville; Delbert, Jr. "Jay" (Patricia) Britton of Columbus, Curtis (Christina) Britton of Logan, Michael (Karen) Britton of Jerusalem; 13 grandchildren, 20 great-grandchildren, and many friends. Visitation will be Sunday, March 31 at the Harper Funeral Home, Beallsville from 1pm to 4pm. Graveside services will be conducted Monday, April 1 at 12 noon at Holly Memorial Gardens, Colerain. To plant a tree in memory of Delbert "Gene" Britton, please visit our Tribute Store. "Email Address" would like to share the life celebration of Delbert "Gene" Britton. Click on the "link" to go to share a favorite memory or leave a condolence message for the family.